Manufacturer of a wide range of products which include dairy homogenizer. We are reckoned as one of the chief Dairy Homogenizer Manufacturers and Suppliers based in India. Made using superior quality raw material, these Dairy Homogenizers are widely demanded in dairy industry due to their better performance and high efficiency. 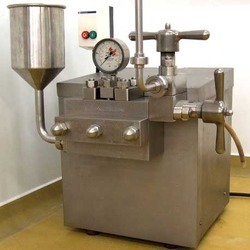 The Dairy Homogenizers offered by us are widely appreciated for enhancing the consistency of a product by dispersion. The Dairy Processing Plants offered by us are known for upgrading the color, flavor and appearance of the products and even avoid occurring of the ring formation. Looking for Dairy Homogenizer ?